Kevin Nolan interview | NUFC Blog. 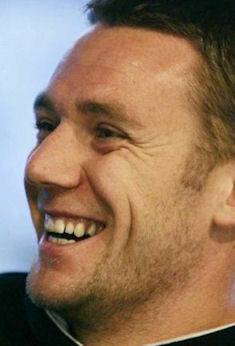 Archive for tag: Kevin Nolan interview. Llambias speak with forked tongue? Former Newcastle United captain Kevin Nolan believes the club forced him to leave and that Derek Llambias reneged on a verbal agreement. “I envisaged spending the rest of my career at the club. I was settled, happy and I adored the supporters. I was captain of a huge club and played with a smashing group of lads I had untold respect for. “But ultimately I was forced out because I lost trust in key people at the club and when you lose trust in people it’s almost impossible to regain it. “From January and shortly following the sale of Andy Carroll to Liverpool, I was involved in ongoing discussions about signing a new contract between four and five years. Newcastle United’s Kevin Nolan speaks highly of the fans. “Sunderland have gone out and spent millions and millions of pounds. “If we had have had the chance to do that and bring players in, we would have been a bit higher than we are. “Then you see Steve Bruce saying he’s got to buy seven players in the summer. “That’s a target [finishing ahead of Sunderland] to make sure we finish the season strongly. “It’s something we can work on – I don’t see why not. “We don’t really want this season to peter out – we want to finish strongly and get the momentum for next season”. Too right. Most fans can forgive losses as long as the team has given its all. It’s those games where effort is lacking that really get the fans angry. Newcastle United captain Kevin Nolan reveals he’s ‘hopeful’ about the future of the club, whilst Alan Pardew praises Nolan as a better player than he thought he was. Kevin Nolan’s goal against Bolton on Saturday means he now has 11 for the season, which is not bad for a midfielder, albeit one that often slots in close behind the striker(s). Personally I find Nolan a bit frustrating. He sometimes seems to ‘disappear’ for large portions of the game in terms of his general midfield contribution, but he frequently ‘reappears’ to put the ball in the back of the net, which is not to be sniffed at. Although feel free to sniff if you wish – I’m not a man to stop professional sniffers. “I hope and I think that Mike and Derek are in it for the long haul here. “We’re all working together to get Newcastle back where it belongs. It’s going to be bit by bit and we can’t get carried away but it will be nice when they get us back. They can sit and smile knowing they’ve worked so hard. “All we’ve asked for is a bit of stability and giving lads new contracts when they deserve it.